It's common knowledge that Cadillac cars were once refitted to serve as ambulances (and still bring out the dead as hearses). But did you know that an Eisenhower-era custom shop once turned Caddys into RVs? "Lefty, find us a KOA near Vegas, ya friggin' mook." I happened upon this one after visiting the Gateway Auto Museum in Middle-of-Nowhere (Gateway), Colo. 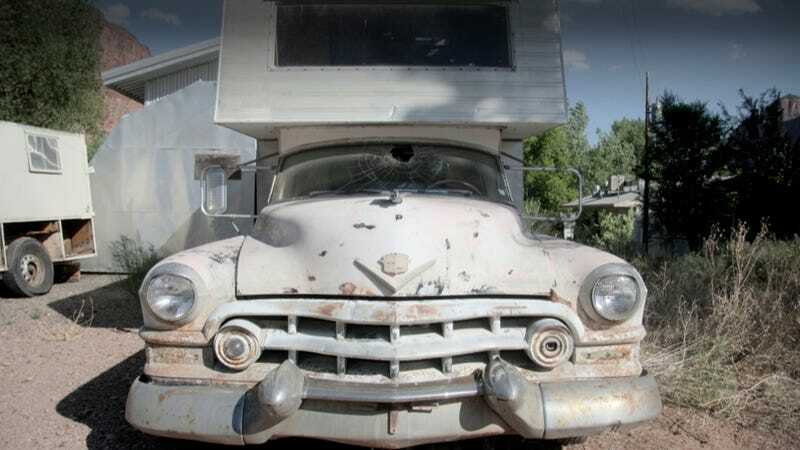 It was sitting in front of a diner in an out of the way corner of the state that was once a uranium mining boomtown, and is now a shriveled clump of weather beaten trailers and small houses next to a resort built by Discovery Channel magnate (and classic car collector) John Hendricks. It's a quiet town with not much going on, but the surrounding red rock palisades are stunning. This '53 began life as one of Cadillac's hearse/ambulance chassis models, modified to its current, more livable shape by some oddball genius. It's powered by the original 219 hp 331 cid V8, a column shifted 3-speed manual transmission, and a longer than normal 157-inch wheelbase (the sedans have a 126-inch wheelbase). Plus it looks cool. I've definitely seen weirder looking RVs in my travels, and was pretty stoked to learn that there are a few of the Superior and Miller-Meteor platformed RVs out there still. Don Johnson owns the Caddy RV and the currently closed diner it sits in front of (he's looking for new management). He said it's been parked there for about a decade. The prior decade found it perched in front of Bert's Auto Supply in Moab, Utah. "I kept driving by it, for years, and finally went and bought it," Johnson said. But he never did anything with it. Running the diner and Strawberry Park Hot Springs miles away in Steamboat Springs cut into the time Johnson thought he'd have to fix up the old camper. "It would be cool if someone would paint it pink, keep the outside all original, but do up the interior in neon, with all the modern conveniences," he said. He has other cool toys parked next to the circa 1920s diner: a 1947 Chevrolet 5-window pickup and a 1948 Studebaker milk truck. Mr. Johnson is like so many of us who collect cool stuff, but never get around to doing anything with it. I have a pile of derelict Subaru parts in my house that are the result of this type of thinking, and I have a friend with 20 years worth of old Toyota FJ's sitting in an obscure high desert lot, waiting for the day that they'll be restored or carted away to the junk pile. Hopefully, someone with the time and money on their hands will take an earnest stab at cleaning up Mr. Johnson's Cadillac RV. I mean look at the thing. Airstreams are played out; this is unique. Just think, traveling around in a Cadillac RV would bring a sort of Ghostbusters chic to the camper van world.